It has been talked about for a while but recently plans have been released for what is regarded essential the success of the northern powerhouse agenda. The Trans-Pennine tunnel will link Manchester to Sheffield and the M1 and dramatically reduced travel times across the Pennines. With the project being potentially the worlds longest road tunnel the development will comes with an array of challenges. Not just from a design and build perspective but also from the passenger experience. 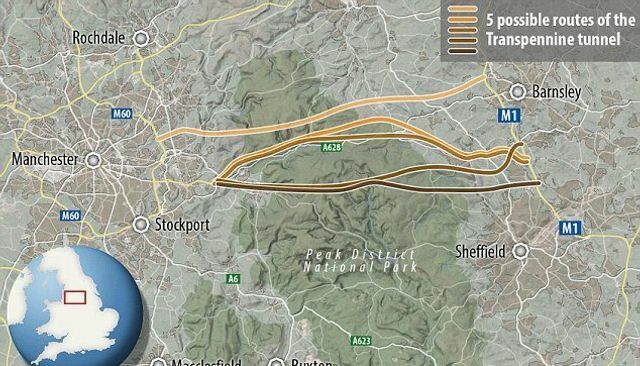 The UK’s Department for Transport has recently published a study that shows five potential routes for its plans to build the longest road tunnel in the world.The Trans-Pennine tunnel, which will cost around $7.8bn (GBP6bn), will stretch between 16-29km long, and will cut commute from Manchester to Sheffield by 30 minutes.According to the Telegraph, experts have warned that road users could suffer "psychological difficulties" because of the length of the tunnel.The Trans-Pennine tunnel study was launched by the UK government in autumn 2015 as “one of a number of studies aimed at addressing some of the biggest challenges facing the road network in the UK,” according to a statement from the Department for Transport.